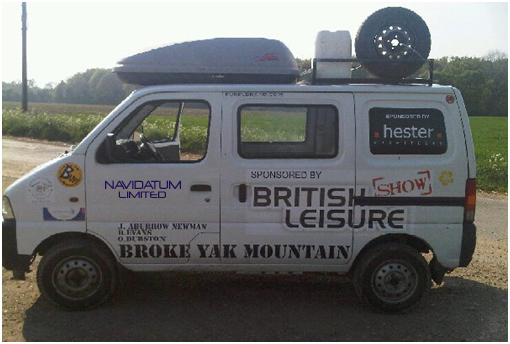 Navidatum are supporting the Broke Yak Mountain team in the 2011 Mongol Rally. M2M equipment allows visibility of the team's location for the benefit of family & friends and grants an ability to message between the team and followers anywhere in the world. We have now added the Google Earth version of the rally route. These messages are coming direct from the team's Suzuki Carry van (aka ‘The Kid Frankie’) which is fitted with a Navidatum Machine to Machine (M2M) satellite terminal, one of a wide range which includes everything from satellite phones to broadband terminals enabling communications anywhere in the world, even in the wilderness where mobile phones cannot reach. M2M terminals are powerful computers about the size and weight of a domestic smoke detector, comparable with a high-end mobile phone both in terms of price to buy and 'airtime'/text message cost. There are a huge number of devices which can be connected to the terminal to monitor anything from driver ID to engine parameters automatically and then report back with a tiny digital message to our server which decodes it and alerts the relevant parties accordingly via the web, email or SMS (hence Machine to Machine). The built-in satellite transceiver and GPS allow the whole process to be georeferenced so that everyone who needs to know, can see exactly where, what and when things are happening to their friends and family, employees and assets. Navidatum uses Google or Bing maps for the dry bits of the planet but when it comes to the seas and oceans our good friends at Chersoft who are also kindly hosting this website, have spent many years writing specialised marine navigational software which is used on everything from yachts to container ships, they also know more about tides than virtually anyone else in the world. When the team get close to the sea around Venice we can show you some of the Nautical charts which cover the areas where neither online maps nor mobile phones can reach. The messaging, and the actual navigation in the case of a yacht installation, is carried out on an ordinary laptop connected by USB to the terminal so that you can plan, execute and review your adventures from the same machine, share them live online and keep them forever when you and the laptop get back home. While your boat is unattended the terminal watches the bilges and batteries and also lets you know if the hatches or doors have been opened, if the engine has been started or if the boat has moved from where you left it. If everything is OK it still sends you a free message every day just for peace of mind. Fact:- Did you know that only 29% of the earth’s surface is land and that only about ⅓ of that is covered by almost 1500 territorial cell phone operators who charge roaming fees if you want to move around the world.